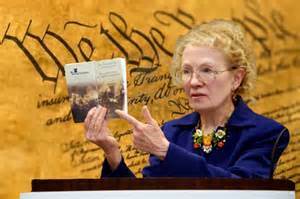 At an October 29th 2016 speech to a small gathering, Publius Huldah addressed the dangers posed by an Article V Convention of the States to propose Constitutional amendments. After viewing the entire talk, I understand why the leading figures of the Convention of States movement (COS) haven’t responded in depth to her various accusations. Her conclusions are often at the fringes of reason and she carries a deep and personal animosity to the leaders of the COS. Since the COS leadership choose not to address most of her accusations, please allow me, your humble blogger, to take up the mission. View COS supporters as conspiratorial enemies. Just obey the Constitution as written. Support state nullification of federal laws, regulations, and scotus decisions. Mix her talking points, let them ferment, and Ms. Huldah presents a powerful and heady brew against an Article V convention of the states. The foundation of her argument is a conspiracy in which nefarious groups, foreign and domestic, work toward our demise. The means to their ends is the Article V state amendments convention. Since COS supports an Article V convention, its leaders must be part of the scheme, and the many thousands of COS volunteers are simply ignorant dupes who don’t recognize the danger. In this battle for national survival, the leaders and useful idiots of COS aren’t misguided; they are enemies. Our status as enemies justifies the snarky, rude, and insulting arrows that Article V opponents often let loose at the COS movement. We are not thoughtful men and women who take a different approach to the same goal, the restoration of free government. As such, we deserve no respect, and hence the insults and derision. In her speech, Ms. Huldah was relatively polite. While she occasionally sneers, the worst term she uses, and repeatedly, is the “con-con lobby.” Whether she means constitutional convention, constitutional con job, or perhaps, constitutional conspiracy, it is a derogatory term designed to marginalize our efforts to save a once great republic. Publius Huldah is a thorough patriot. She conducted extensive research into domestic and international organizations that do not have the best interest of the United States in mind. Until the Wiki Leaks and Project Veritas revelations, I was skeptical of foreign influence in our elections and even the dirty tricks of the democrat party. No more. She connected many dots, but unfortunately concludes that the COS movement is part of a plot to extinguish American sovereignty. Having established in her mind that the COS works toward our national destruction, she travels backward from there and misrepresents history to support her conclusion. While Ms. Huldah has a steel-trap memory, and can probably rattle off all twenty-seven amendments to the Constitution, there is a surprising lack of depth in her arguments. They are often shallow and based on distortions of events and writings from the Framing generation and COS proponents. I find an underlying sense to her lecture that squints toward a Hobbesian state of war among individuals rather than a cooperative Lockean civil society. No, she doesn’t call for Leviathan government. On the contrary, she cries for mass education in first principles to return our nation to free government. But, her broad assumption is that few in society today, except herself, can be trusted with the Natural Right to self-government. By the end of her fifty-minute talk, one could easily conclude that Ms. Huldah was the last remaining virtuous person in America, and the rest of the nation conspires with dark forces to enslave our nation under a New World Order. Ms. Huldah looks around and finds no James Madisons, no Thomas Jeffersons to lead a dumbed-down 21st century mob to free government. Combine a dim view of American society with fear of conspiracies, and one could conclude that an Article V convention is indeed dangerous. If, as she says, the people are so hopelessly immoral, it follows that they are incapable of self-government at all, and have no business participating in republican governance. I reject her estimate of the American people. As if to likewise disagree with Ms. Huldah’s view of society, and only a few days after her lecture, half of American voters rejected Hillary Clinton’s modest offer to serve as sovereign mistress of a Leviathan state in return for promises to give everything to everyone. Perhaps the election changed Ms. Huldah’s mind. In any event, I am certain our nation is not as morally decrepit as she asserts. The remaining posts in this series examine the elements of Publius Huldah’s opposition to an Article V Convention of the States. Hang on for a rough ride. The John Birch Society vs. Article V.
Phyllis Schlafly vs. Article V.
Wow! Great introduction. Can’t wait for Chapter 1. Great example of narcissism gone wild. Amazing how such people consider themselves so far above Constitutionalists such as Farris, Natelson, Levin, Gov. Abbott, Pres. Reagan, Friedman, Scalia, Dirksen, Rand Paul, Allen West, Sheriff Clarke, Cruz, Rubio, Huckabee, Dr. Carson, Palin, and everyone that signed the constitution. No, all these great Americans must be wrong. 29 out of 99 (67 needed in total) state houses have already passes the COS Project Resolution in the last 3 years. But, no only this small band of Huldahists know best. Really? No organization is doing more to educate Americans and the world about self government than the COS Project. I have no problem with nullification except it has no real success to speak of and no apparent movement. Article V has 27 amendments to draw from. The first ten (Bill of Rights) and others were direct results of COS applications. I think freedom lovers should use all tools in the box. Thanks for leading the charge Rodney. We must stay on the offense. Yes. We do need to enforce the Constitution. But the intent of the ORIGINAL Constitution not the one we currently have that has been gutted and corrupted. These small minded people need to grasp the destruction they are endorsing of supporting the status quo and reliance upon fear. Help us encourage our state legislators to be courageous and enforce the intent of the ORIGINAL constitution which is limited and self government. With so many state houses in GOP hands, the time is NOW to press for a COS! “Publius Huldah” (real name: Joanna Scutari) lives in Tennessee where the General Assembly flatly rejected her arguments, and the arguments of a few other “experts” in the Constitution, by votes of 23-5 in the Senate and 59-31 in the House. (The COSP resolution had 59 cospsonsors in the House. Three of the cosponsored were not there for the vote due to illness, thus the vote should have been 62-31 in the House). Only a small handful of “limited government” Senators and Representatives listened to the “runaway convention” arguments and voted against the COSP Resolution. They did so despite having, on average more than 100 citizen petitions per Rep and 300 per Senator from their district supporting the COSP resolution. Why is that? Every lawmaker, whether they admit it or not, listens to a small number of “advisors” on key votes. Those few “limited government” Representatives who voted against the COSP resolution had advisors surrounding them who were steeped in multiple decades of lies about the Article V convention. Those lawmakers ignored the petitions of their citizens, and the reasoned arguments of many true experts, and instead acted out of the fear roused by their small set of advisors concerning the “runaway convention” myth. It takes a LONG time and much concerted effort to dislodge decades of misinformation, particularly when that misinformation has reached the stage of mythology. An argument reaches the stage of mythology when people go to great lengths to outdo each other in support of the myth, including proposing conspiracy theories and denigrating others who oppose them. It is part of their “credentials”, even their identities, to oppose Article V at all costs and no matter how spurious the arguments employed — so long as their listeners are “hyped up” to oppose Article V.
The volunteers in Tennessee have turned many hundreds of “limited government” leaders in the State who had previously believed the false “runaway convention” narrative. We did not have the time to get to all of the advisors surrounding the Reps and Senators who voted no, but we continue to work to get as close to 100% support as possible. Joanna Scutari’s voice and influence on this topic is dwindling. Her arguments have been defeated. But the message has not reached everyone. It does not hurt to continue to spread the truth so that we can influence the few remaining pockets of resistance to Article V in Tennessee and in the few other states where Ms. Scutari spreads false information regarding Article V.
We look forward to the further analysis of her arguments in this series.